Beginning in early April, improvements and renovations will be coming to an often used, pothole-filled, city-owned parking lot in the heart of Kamm’s Corners. CLEVELAND — Beginning in early April, improvements and renovations will be coming to an often used, pothole-filled, city-owned parking lot in the heart of Kamm’s Corners. The improvements, officials said, will not only improve the aesthetics of the area but also prevent as many as one million gallons of stormwater from entering the city’s sewer system each year. The municipal parking lot near the corner of West 168th Street and Albers Avenue serves as a major waypoint for people coming to and leaving from numerous bars, restaurants and shops in Kamm’s Corners. After years of wear and tear it is certainly showing its age. “It’s challenging. I’m glad I have four-wheel-drive,” said resident Steve Ryan, who uses the parking lot at least twice a week. There are multiple large potholes in the main drive. The cracks in the concrete resemble a series of spider webs. 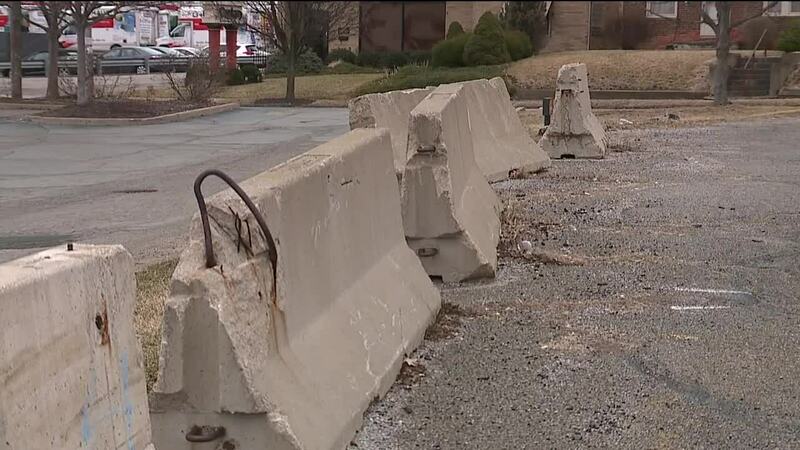 A half dozen rusted jersey barriers buffer the steep slope between the city’s lot and the lot belonging to a nearby drug store. The condition of the parking lot becomes readily apparent in the spring and summer months when patrons of the Kamm’s Corners farmers market have to bob-and-weave the holes, dips and valleys. As part of the project, crews will build several “bioswales.” The landscaping feature is comprised of a large hole with gentle slopes. Inside the space will be carefully picked vegetation and gravel, which act as natural water filters, removing contaminants like gasoline, motor oil and salt. Acting much like a french drain, the bioswale will then allow water to seep back into the soil — not the sewer. The largest bioswale will be at least 60 feet wide and 20 feet deep. Multiple other bioswales will flank the eastern and western edges of the lot. In an effort to help facilitate projects that reduce the number of combined sewer overflow events — as well as stay in compliance with Clean Water Act standards — the Northeast Ohio Regional Sewer district offers grants to public entities and private companies that implement ‘green’ projects like the Kamm’s Corners parking lot. The parking lot renovations will be the latest addition to the area. In the past two years, Kamm’s Corners Development Corp. has installed several security cameras as well as LED lighting. Construction on the parking lot is anticipated to take slightly more than two months. However, large portions of the lot will still be accessible during construction. “This is the main parking lot for our retail and hospitality district. It’s very important to us,” Lorenz said.